One of the most immediately obvious characteristics of a twisty puzzle is the shape of the outer shell. This makes a huge difference to the superficial appearance of a puzzle, but it usually turns out not to have much effect on the play of the puzzles as the inner core and the cut. The first thing to note is that there is absolutely no need for the outer shell to possess any symmetry. You can make a twisty puzzle in any darn shape you want. Indeed, there are novelty puzzles on the market in the shape of Darth Vader, Batman, Homer Simpson, Bugs Bunny…. Because if you align the n-fold turning axes of your core with n-fold axes of symmetry of your shell polyhedron, then rotations of the core will move the components of your shell from isometry to isometry, and your shell will always maintain its shape. Let me make the implications of this second point clear. If you think that puzzles naturally scramble without their shape getting jumbled up, and it takes some kind of genius to make a puzzle that jumbles, then you are mistaken. It is the other way around. Puzzles naturally jumble. It takes a deep understanding of symmetry to make a puzzle that scrambles without jumbling. Fisher’s Cube, one side turned 90° — a move symmetric on the core but not on the shell. Fisher’s Cube is a Rubik’s Cube variant that nicely illustrates our points. 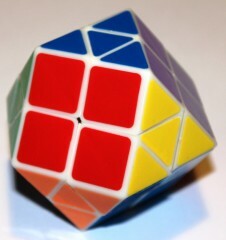 The core is exactly the same as the Rubik’s Cube: based on the face-turning conjugacy class for cube rotations, it provide for two turning layers per axis. The outer shell is also a cube. 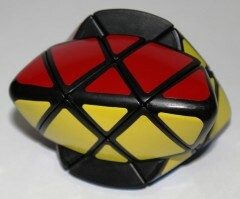 Unlike the standard Rubik’s Cube, however, the core’s axes of symmetry do not match the shell’s axes of symmetry. In Fisher’s Cube, only one of the core’s axes pass through opposite face centres of the shell. On that axis alone, the fourfold symmetry of the core matches the fourfold symmetry of the shell, so those two faces can be rotated through 90° without jumbling the cube. The other two axes of the core pass through the edge centres of the shell cube. Edge centres are axes of symmetry for the cube, but only two-fold. If we rotate a face around one of these axes by 180°, we move the pieces of the shell from isometry to isometry, and the cube retains its shape. But if we rotate a face around one of these axes by just 90°, we don’t reach an isometry, and the result is something that isn’t a cube any more. The Master Pyramorphix is another beautiful example of a jumbling puzzle. The core is the same as the Rubik’s Cube: three axes each with fourfold rotational symmetry. But rather than make these axes pass through the face centres of a cube shell, in the Master Pyramorphix they pass through the edge centres of a tetrahedron shell. As with Fisher’s Cube, these edge centres are axes of rotational symmetry for the tetrahedron, but only twofold, not fourfold. 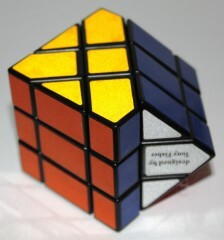 As a result, the Master Pyramorphix offers two puzzles in one. It can be scrambled using only 180° turns, resulting in a puzzle that retains its tetrahedron shape and can be solved using only 180° turns. Or, it can be given 90° turns, in which case its shape becomes jumbled.